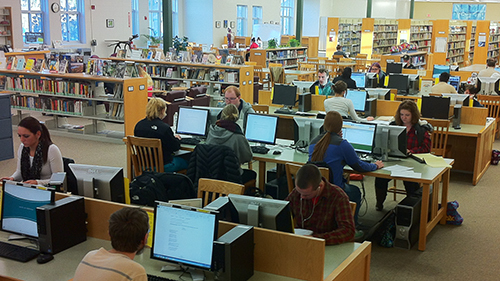 The MCC Library is a central part of the student experience at MCC. The library offers welcoming spaces for students to congregate between classes, get research help from librarians, borrow laptops, print out assignments and work with peer tutors in the Academic Success Center. This website is the online library--available 24/7. Its databases, eBooks and research guides provide credible sources for students' research projects and papers. Please explore! We welcome suggestions from faculty and students. Please use the email form in the "Contact Us" box to share your feedback or questions or ask about an item you'd like us to add to our collections. The MCC Library has created online research guides that organize library and external resources by subject. If you are interested in having the library create a guide or if you have information to add to an existing guide, contact a librarian. We also have a series of guides designed to introduce students to using the library and doing research. Please encourage your students to use these, and feel free to link to any of our guides in your Canvas courses, syllabi, and assignments. Download our quick guide to library resources and services available to faculty at MCC. Online version of the print publication with additional features including higher education job postings. Updated daily. From off-campus, please set up free account using your ccsnh.edu email. The MCC Library provides online access to thousands of journals and other publications. See our complete list of Article Databases. You can check if we provide access to a specific publication, by searching eJournals by title from the tab on the library homepage.